Above: GOES-16 view of large Hurricane Maria (left) and small Hurricane Lee (right) at 10:30 am EDT Tuesday, September 26, 2017. Image credit: NOAA/RAMMB. GOES-16 imagery is considered preliminary and non-operational. Tropical Storm Warnings and Storm Surge Warnings were up for much of North Carolina’s Outer Banks on Tuesday as a weakening Hurricane Maria headed north at 7 mph. Winds were rising along the Outer Banks Tuesday morning, and were 33 mph, gusting to 40 mph, at 10:30 am EDT at the USCG station at Cape Hatteras, NC. The Diamond Shoals buoy located 15 miles southeast of Cape Hatteras recorded sustained winds of 34 mph, gusting to 40 mph, at 10:50 am EDT. According to the NOAA Tides and Currents Quicklook page for Maria, storm surge heights were also steadily rising along the coast of North Carolina and Virginia on Tuesday morning, with the highest storm surge of 2.2’ observed at Cape Hatteras, NC at 11 am EDT. Storm surge heights of 1 – 1.5’ were observed Tuesday morning to the north of Cape Hatteras, from Duck, NC to Norfolk, VA.
Satellite imagery on Tuesday showed that Maria was continuing to weaken, with its heavy thunderstorm activity confined to the southeast side of the center, away from where strong upper-level winds of 15 – 20 knots out of the northwest were shearing the storm. Maria no longer has an eye or an eyewall, and Maria is a large storm whose outer spiral bands were bringing rain showers to the Outer Banks, as seen on regional radar. Maria continues to move over the cool waters churned up by Hurricane Jose last week, and is expected to continue experiencing moderate wind shear over the next day. Our top intensity models predict that a slow weakening of Maria will result, with the storm being a tropical storm or low-end Category 1 hurricane with 60 - 80 mph winds by Wednesday morning, when Maria is expected to make its closest approach to North Carolina. Figure 2. 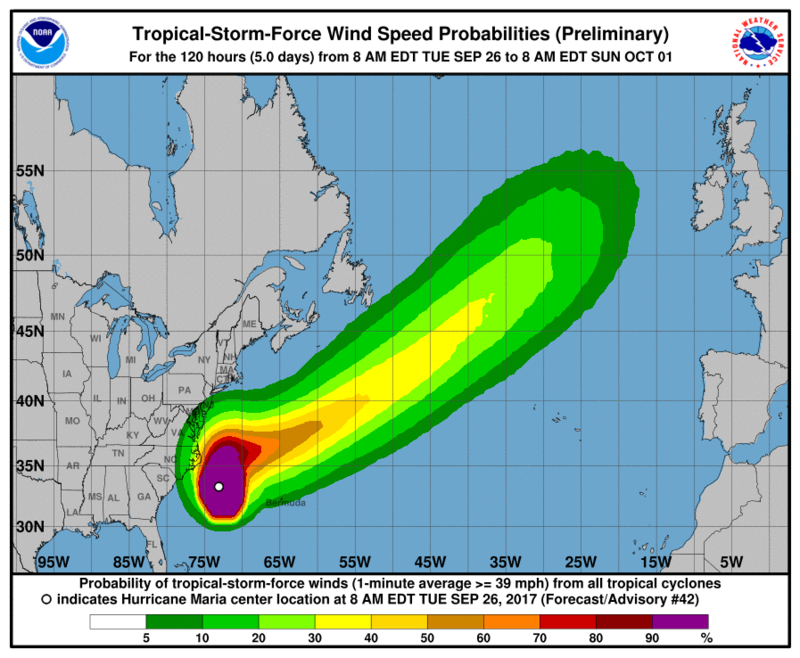 The 11 am Tuesday NHC forecast for the probability of tropical-storm-force winds for the five days ending at 8 am Sunday, October 1, 2017. The Outer Banks of North Carolina were given about a 50% chance of tropical storm-force winds of 39+ mph, and the Norfolk, Virginia area, about a 20% chance. Image credit: NOAA/NWS/NHC. 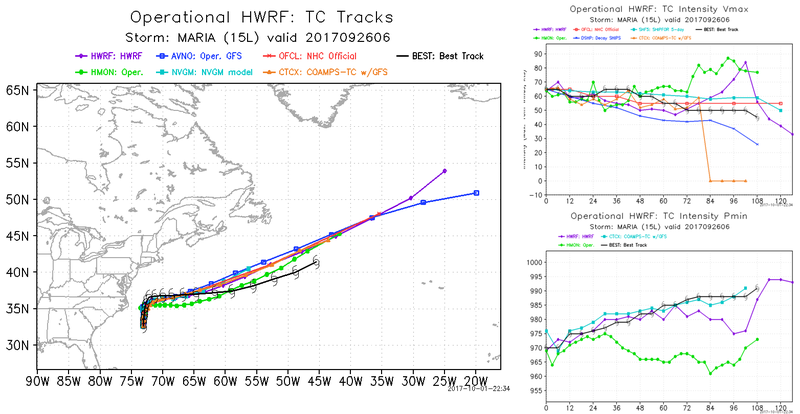 The model forecasts for Maria have not changed much over the past day, with all of our top models predicting that the hurricane will make its closest approach to North Carolina on Wednesday, when it will come within about 170 – 200 miles east of the Outer Banks. We can now dismiss the possibility that Maria will make landfall in North Carolina. By Thursday, a trough of low pressure passing to the north of Maria will pull the storm rapidly east-northeastward out to sea, and this demon hurricane will be done troubling any more land areas. Tropical storm-force winds extended about 185 miles to the northwest of Maria’s center on Tuesday, and are predicted to maintain that radius of coverage through Wednesday. Thus, it is likely that the Outer Banks of North Carolina will experience sustained winds near 35 - 40 mph on Tuesday night and Wednesday, and about 1 – 2” of rain. The counter-clockwise circulation of Maria, combined with its slow motion, will be capable of driving a storm surge of 2 – 4’ to the coast about 50 miles on either side of Cape Hatteras, North Carolina. This may flood the only road into or out of the Outer Banks, NC 12. Last week, waves and storm surge from Hurricane Jose washed over the road and damaged the dunes protecting it. Figure 2. 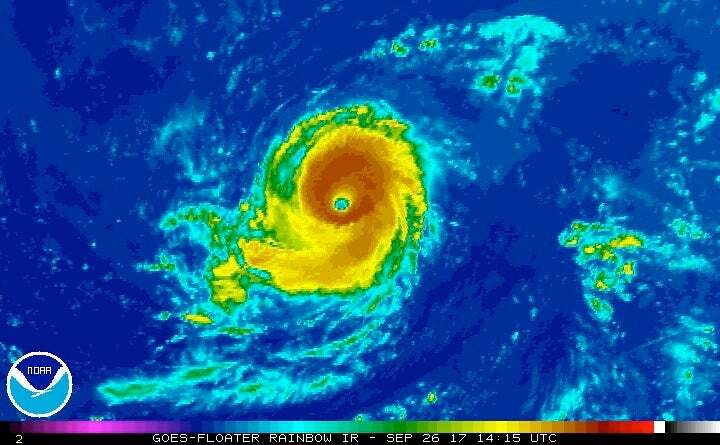 Enhanced infrared image of Hurricane Lee at 10:15 am EDT Tuesday, September 25, 2017. Image credit: NOAA/NESDIS. Will Lee be our next major hurricane in the Atlantic? We may get this year’s fifth major Atlantic hurricane (Category 3 or stronger) this week—and for once, it’s a storm that will pose no threat to populated areas. 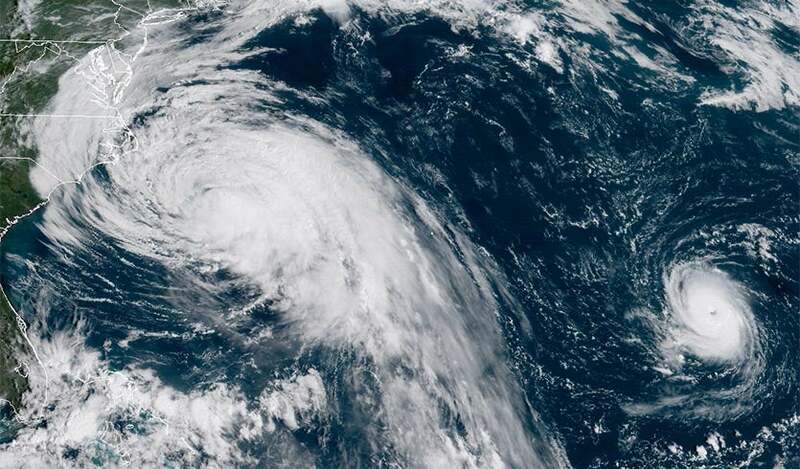 Hurricane Lee continued to make its way harmlessly through the central North Atlantic on Tuesday, with top sustained winds up to 105 mph as of 11 am EDT. With the ascent of Lee to Category 2 strength early on Tuesday, the Atlantic has now seen a total of seven Cat 2 hurricanes in 2017. That’s the most observed in any year since 2010, which produced nine Cat 2s. Located about 700 miles east of Bermuda, Lee was heading west at 10 mph. This motion should continue till around Thursday, when a strong upper-level trough—the same one carting Maria away from the U.S. East Coast—will begin hauling Lee northeastward on a sharply recurving path. Lee remains very compact, though it has enlarged just a bit: hurricane-force winds now extend up to 15 miles from its center, with tropical-storm-force winds as far out as 45 miles. As is often the case with smaller hurricanes at higher latitudes, Lee has a “cold” look on satellite images, with relatively low-topped thunderstorms around a small, well-defined eye. Lee is moving over SSTs of around 28°C (82°F), roughly 1°C warmer than average. Wind shear is predicted by the 12Z Tuesday SHIPS model to remain at or below 10 knots until Thursday, when the shear will get considerably stronger (20 – 30 knots). Lee is predicted to stay embedded in a quite dry atmosphere (mid-level relative humidity around 40 – 45%). However, because its circulation is so small, Lee may be able to wall off the dry air effectively and take advantage of the warm SSTs and light shear. The SHIPS model brings Lee to the threshold of Category 3 strength, while our top intensity model—the HWRF—makes Lee a major Cat 3 storm on Wednesday, as does the HMON model. Given its small size, it’s quite possible Lee will vault to Cat 3 strength fairly quickly, and then decay just as quickly later in the week. —Unprecedented amount of accumulated cyclone energy (ACE). 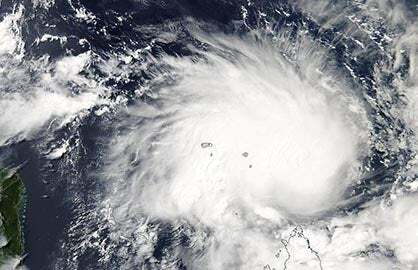 ACE is a measure that incorporates the top sustained wind speed of each tropical cyclone at each point in its lifespan. 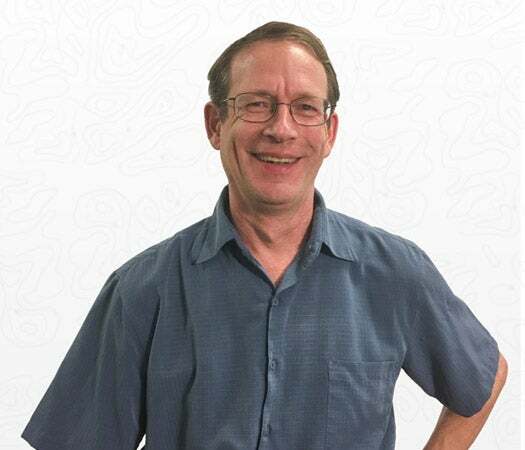 Phil Klotzbach (Colorado State University, or CSU) reported on Tuesday that the Atlantic’s ACE total for September thus far was 155.4. This beats out September 2004 as the highest Atlantic ACE for any month on record. Notably, though 2005 was the busiest Atlantic year on record in a number of ways, no single month that year saw as much ACE as this past month has. Klotzbach notes that ACE was likely underestimated a bit in the pre-satellite era, before the mid-1960s. —Largest number of hurricane days on record (the total of the number of days each storm has maintained hurricane strength). As of Tuesday, Klotzbach reported that September had notched 35 hurricane days, topping the 34.5 hurricane days reported all the way back in September 1926. 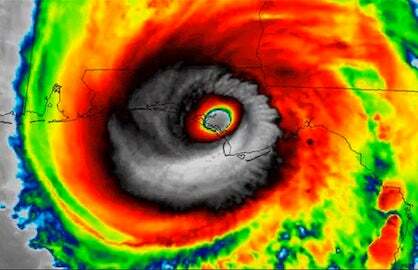 As with ACE, hurricane days were likely underestimated somewhat in the pre-satellite era. As of Tuesday, the Atlantic had seen a total of 13 named storms, 8 hurricanes, and 4 major hurricanes (which could jump to 5 if Lee makes the grade). The most recent batch of seasonal forecasts from NOAA, CSU, and TropicalStormRisk.com predicted that this year would produce anywhere from 14 to 19 named storms, 5 - 9 hurricanes, and 2 – 5 major hurricanes, so we are already near the top end of outlooks for the entire season when it comes to hurricanes and major hurricanes, with more than two months left to go in the official Atlantic season. The New York Times has a list of local, national, and global charities providing relief for those affected by Hurricane Maria. The Portlight.org disaster relief charity, founded and staffed by members of the wunderground community, is responding to Hurricane Maria. Perhaps the hardest-hit portion of Puerto Rico is the island of Vieques (population 9,000), located off the southeast coast of the main island. Vieques received a battering from the strong northern eyewall of Maria, and is running out of food and water. A gofundme campaign from a group called ViequesLove is aiming to bring relief to Vieques. USVI Recover is the official site for recovery efforts in the U.S. Virgin Islands from Hurricane Irma and Hurricane Maria. The nonprofit Community Foundation of the Virgin Islands (CFVI) has established the Fund for the Virgin Islands, with 100% of donations benefiting those in crisis.